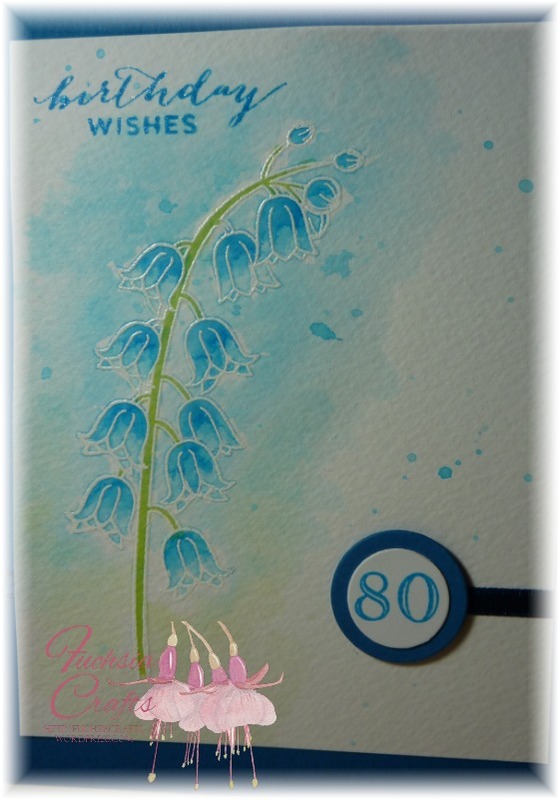 Another day, another birthday card for my Mum’s 80th, this one for my sister to give to her. 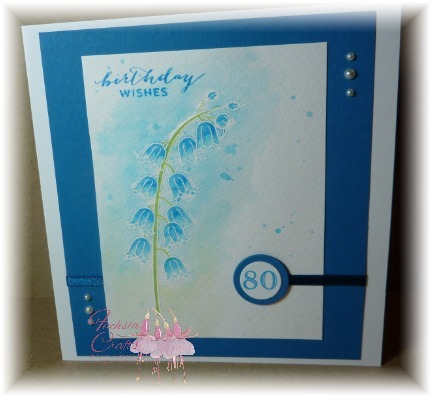 I again used flowers from the Clearly Besotted Fresh Flowers set, watercoloured using Memento Bahama Blue & New Sprout. I based this on the sketch over at Sketch Saturday. The greeting is one of Paula Pascual’s Everyday Tab Messages and although you can’t see it, I added a touch of Wink of Stella to both the greeting and numbers. 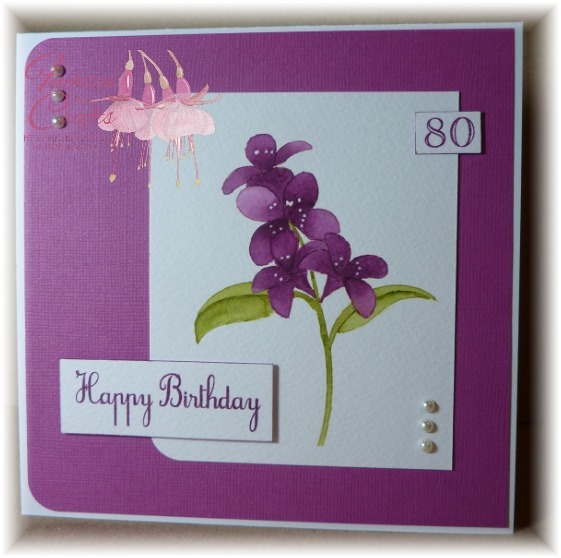 Tomorrow is my Mum’s 80th birthday, and this is one of three cards I ended up making for her. 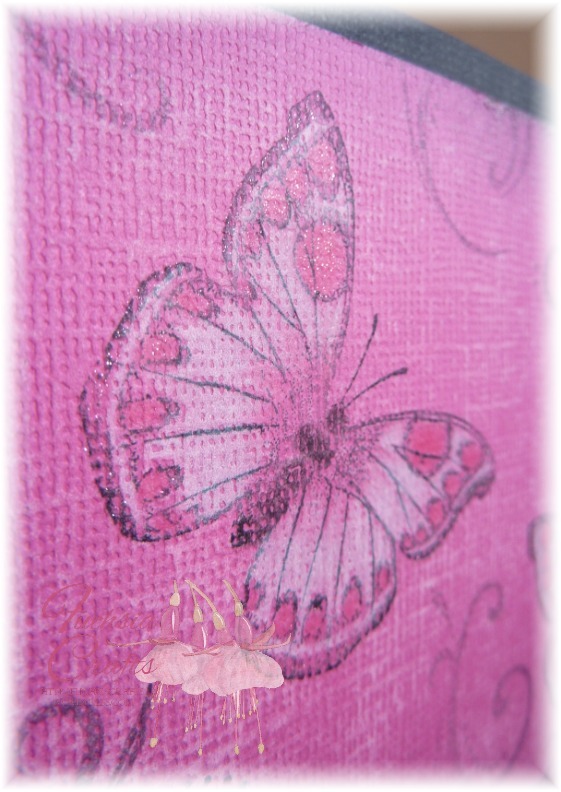 This was my favourite, and it was also the quickest to make. 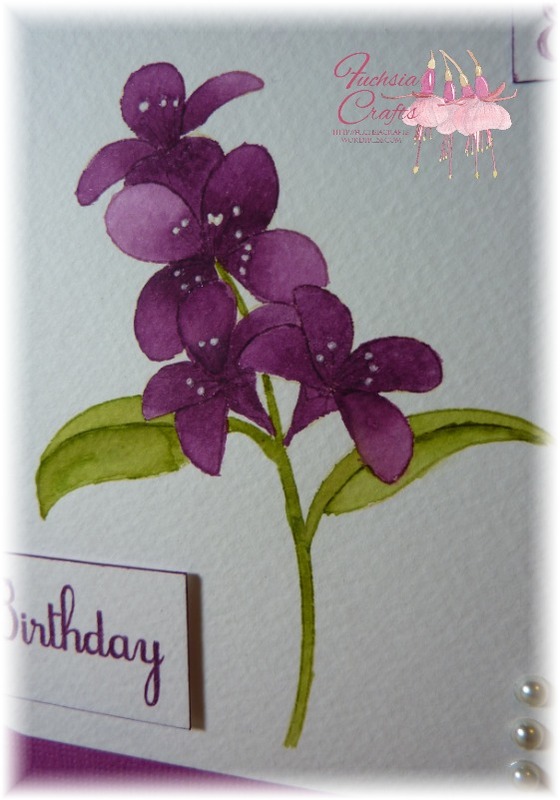 I wanted to use the “no-line” watercolour technique, so I stamped one of Clearly Besotted’s Fresh Flowers stamps using Distress Antique Linen ink then watercoloured it using Seedless Preserve & Peeled Paint Distress Inks. I picked out the white on the petals using a Sakura white gel pen. The greeting & numbers (from the Clearly Besotted Honeycomb set & Kirsty Wiseman’s Alpha Inline set) were also stamped in Seedless Preserve, which I then used to edge the greeting & numbers. 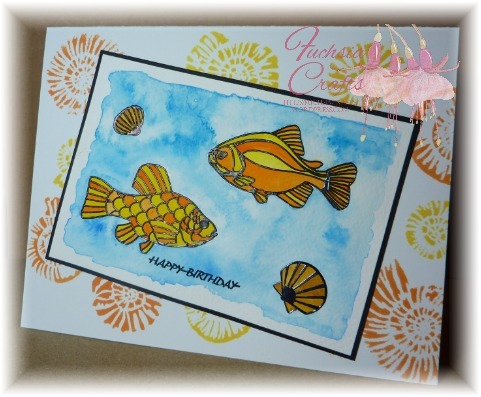 I kept the finished card simple, just adding some pearls & following sketch #162 over at Retrosketches, and I’m also going to enter this into the watercolour challenge over at Challenge Up your Life and Addicted to Stamps where the theme is “Make Your Mark”. My hairdresser, who I’ve been to for more years than either of us would care to remember, turns 40 soon. He’ll be hiding away in Spain on the big day but I couldn’t let the day pass without making him a card. Apologies for the awful photo – I didn’t realise how bad it was until it was too late to take another! 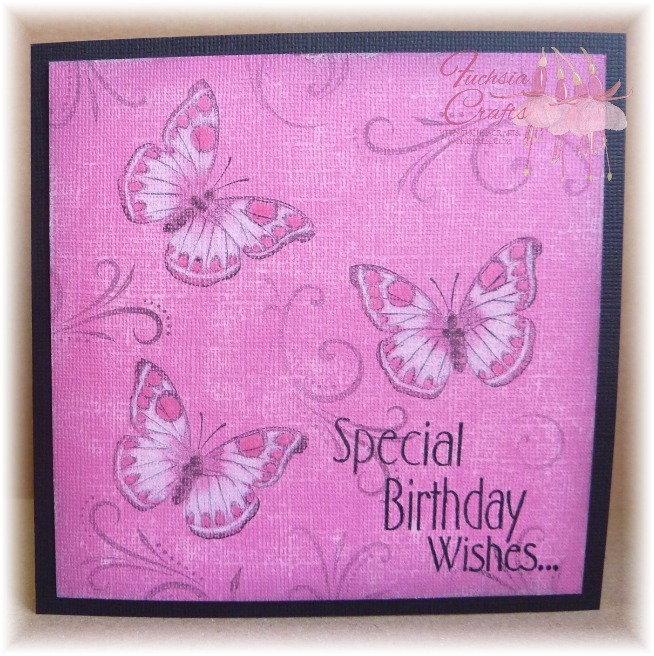 The main image was computer-generated in Craft Artist 2 using Mister Sirloin BTN Rare font, and the papers are by DCWV. The flourishes (again, Hero Arts) were stamped in second-generation Tuxedo Black, then I used the same ink to gently colour around the edges of the card. The greeting by Imagination Crafts was stamped in Tuxedo Black also, but as it didn’t stand out enough I carefully went over the greeting with my Memento marker. I was going to add more bits and pieces, as Kay did, but decided that less was more & simply mounted it on black cardstock. I’ve never been a trend-setter; well, not since I was 15 and was the first girl at school to have her hair cropped short! 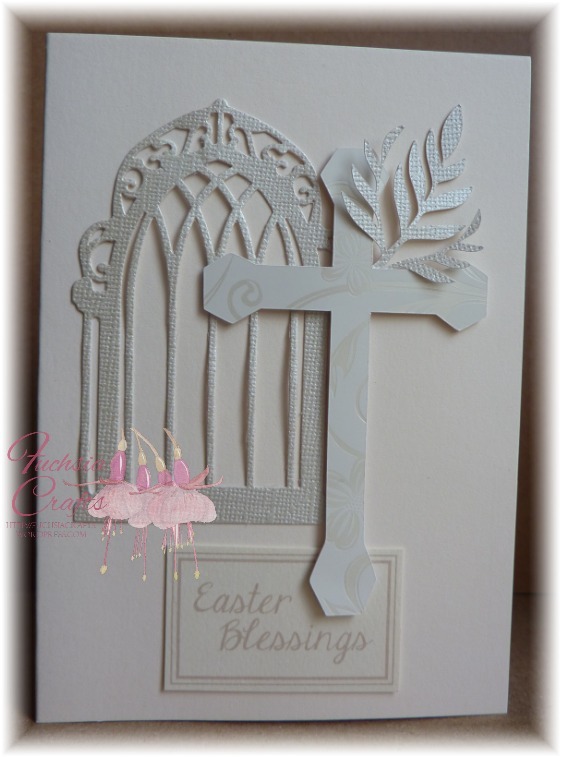 I don’t even particularly follow trends, either, even in card-making – finances usually dictate that I’m a few months behind. So imagine my surprise when, having decided the other day that I really should use some of the outline stickers I’ve had in my stash for years, I discover today that none other than Kristina Werner is extolling their virtues! The outline stickers started out silver but I coloured them with a black permanent marker. I watercoloured (well, what else?!) 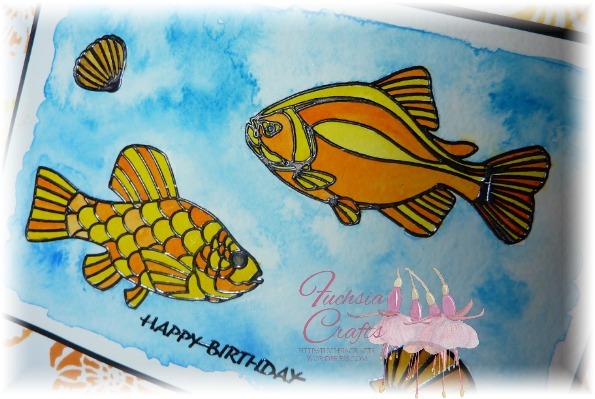 the background first using Cotman watercolours, then painted the fish using really bright colours, which I’m sure is nothing like any real fish! I mounted the picture onto black card, then sponged a background using a TCW stencil and Memento inks.